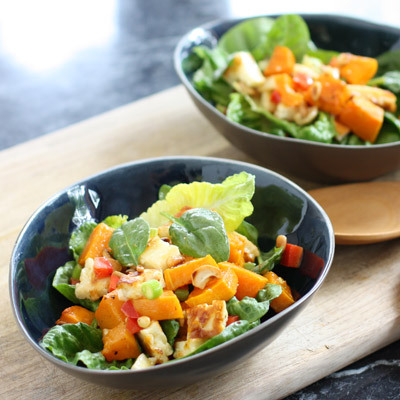 Here’s one last BBQ side dish for the summer – my version of a pumpkin, haloumi and spinach salad. You can serve it cold in summer or warm in the winter, so all you Northern Hemisphere smugglers can enjoy it right now as well. It’s back to the idea I talked about when I made Panzanella – just serve good healthy stuff and enjoy it and hopefully the kids will join in a bit. Miss F likes the squeaky cheese and spinach (with the yummy sweet dressing). Mr M&P doesn’t find much to his satisfaction here yet, with the exception of the cashews and pine nuts. Sometimes these things take time. Cashews and pinenuts are the big lures. Toss the pumpkin cubes in the olive oil, salt and pepper and place in a single layer on the tray. Bake for 25-30 minutes until just tender but not totally squishy. Place a frying pan over medium heat and add the pinenuts. Dry roast, stirring often to avoid burning. Remove and set aside. Return the pan to the heat and add some olive oil. Slice the haloumi into 1cm thick slices and fry on each side until golden. In a large salad bowl, mix together the leaves, onions and capsicum. Toss through the nuts and tear up the haloumi into bite-sized pieces. Pop in the pumpkin. Whisk all of the dressing ingredients together and pour over. Give everything a good mix and either serve warm, or leave in the fridge and serve cold. Serves 4 adults and 4 kids as a side dish. Just thought I’d let you know I made this as part if my contribution for Christmas lunch and it was an absolute hit! I made double the recipe hoping for leftovers and the bowl was cleaned out when all the other salads were still half full. Thanks for the great recipe, so yummy!